Posted on April 13, 2018 at 5:17 am. Who inspires YOU, Williamsburg? We begin today with a special presentation from our teachers, counselors and staff. They’ve got a message for you, wolves, about just how special and important you really are. And now, let’s get back to the announcements. National Library Week wraps-up today — and we have the results of the third Library Trivia Challenge! Congratulations to all of our winners! Be sure to stop by the Library today to claim your prize. And now — to present our FINAL Library Week Trivia Challenge, please welcome back to the WOLF-TV set our wonderful Williamsburg librarians: Ms. Lord and Ms. Tan!! LORD: Good morning again, Wolves! I’m Ms. Lord. TAN: And I’m Ms. Tan. We’ve had such a wonderful time hosting National Library Week. HUNDREDS of students have participated in the Trivia Challenge, and it’s been so nice seeing you in the library, browsing for books. LORD: For our last trivia question of the week, we’ve upped the difficulty. So put on your thinking caps! TAN: Every year, Ms Lord and I work hard to make sure our library collection is top-notch. Occasionally, we need to discard books that are out-of-date, dusty and old, or just plain have the wrong information! LORD: Recently, we came across two books about whales, both featuring ORCAS on their covers. And after a quick look, we realized that BOTH books had to go. TAN: So the question is: WHY? If you think you know why these two books absolutely do NOT belong in our library collection, then come on up to the library, write down your reason, and drop it in the Trivia Hat by the end of the day. LORD: We will randomly pick TEN correct answers out of the hat, and announce the winners on Monday — all of whom will receive a prize. TAN: So take a good long look at the books. Figure out what’s wrong, and enter the Trivia Contest TODAY! LORD: Good luck, wolves, and thanks for supporting the WMS Library!! The 3rd Quarter just ended — and that means it’s time for our quarterly tradition: the Wolf Pack Lunch! It’s a free pizza party to recognize those students who embody all the best that Williamsburg has to offer. It’s also a chance for students to talk one-on-one with our administrators, and to share their thoughts and concerns about the school. Your teachers have selected honorees from every grade and every team. Those deserving students are all listed on the screen now — and should also have received an invitation from their school counselor. 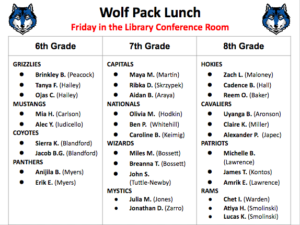 If you see your name, be sure to come to the WMS Library Conference room TODAY during your grade-level lunch — for all the pizza you can eat! Please DO NOT go to the cafeteria first; but come directly to the library. We can’t have the party without you! See Ms. Mays or your TA teacher with any questions. Urban legends — unexplained phenomena — and government conspiracies. Dismiss them at your own peril, because WOLF-TV reporter Cole A. is here to tell you that there’s more TRUTH than FICTION. “Every HERO needs a squad! !” The Pennies for Patients fundraiser is up-and-running! Our goal is to raise 3,600-dollars over the next 3-weeks — all of which will go to the Leukemia & Lymphoma Society and its fight against cancer. And here’s a little extra motivation for you: whichever TA collects the most money will get a free pizza and ice cream party!! See Ms. Kia at Check-In with any questions. The Check-In Program will ALSO be hosting a Candy and Bake Sale TODAY after school, and all of the proceeds will be added to the Pennies for Patients fundraiser. So be sure to come by, get a sweet treat, and support Pennies for Patients! The Boys Cohort will be hosting a special guest speaker on MONDAY during ASP 1 in room 233. Members and allies are invited to come, join the conversation, and learn to become LEADERS in our community. See Mr. Hicks, Mr. Eason or Mr. Valdez with any questions. Finally today — there’s a great big world out there… but there’s an even bigger VIRTUAL WORLD. And student-reporter David K. is here to bring you the most cutting-edge innovations — with TECH on WOLF-TV! !